This topic contains 119 replies, has 14 voices, and was last updated by sonic.penguin 4 years, 11 months ago. Hay guys. Destiny of an Emperor Dong Zhuo mod. I actually did most of my work on this mod in 2011. Made the game more historical for Dong Zhuo, so he starts off in an interesting area. I moved pretty much everything I could early on. Caves, castles, battles, etc. That said, I've only done the first few areas. Would like to know what people think of it though if they want to give it a try. December 2013 edit – Put in some time into this mod. Changed up colors. Changed up music. Changed up characters. Changed up item drops. Added another hour or so of gameplay (game previously ended at Chang An, now it goes past that a bit). Thanks for playing and I appreciate your opinions. <gasp>! You redid/outdid my mod?! <sob> I can give it a try at some point and give ya feedback. - The Lu Bu / Diao Chan back story. - Dong Zhuo just being a lusty drunk tyrant in general. The game already has one of the best points of humor in it… Dong min is a 255/255/255??!!! Haha whoops. I do that with my test copy so that I can run through areas. Check the download link above, it is fixed. Thanks for the first error / fix! lol..
Oh man, LYS doing a Dong Zhuo mod has massive humor potential. Haha, those are good ideas. I'm trying to keep it somewhat serious for the first part, but after I get to where Dong Zhuo died in real life it'll be all fictional stuff of course so I'll do some of that kind of stuff later on. Yep, that's a problem I encountered with Luo Yang. Since I set it up so that we encounter it from the north, I never figured out how to find the hex value that sets you below the place until you defeat it rather than above it. You shouldn't be able to get there anyway. There should be a battle at the castle before that, I must have taken that out to make it easier to go through. Sorry for the hassle, just re-uploaded. 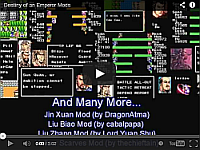 Check the link above and that should fix it (Not the appearing below Luo Yang bug, but rather there is a boss battle at the castle above that now). Thanks again for the fixes. I should have double-checked before I just uploaded it, clearly . I really shouldve taken note of those castles that have different addresses for entrance, exit, and death/restoration castles as those all have entries that need to be edited. For example, after you die you are transported back to the castle @ liu bei's feet, well, if you exit, and you changed the castle entrance/exit, you could come out in the middle of the field where the castle used to be but isnt anymore… kind of hard to explain, but those are the main 3 issues you run into w/ SOME castles. Ru Nan is particularly difficult, as is Luo Yang b/c it is used for a number of different events. Shifter, did you ever finish the ROI mod? I never got to hear your final thoughts. if u ever want any help with any future projects i would love to get familiar with the hacking aspect and give my input for future ideas and even try making one myself if i ever get as good at it as u!